“The fig tree in my garden has stopped fruiting. All its proud, handsome leaves, once erect and filled with prana, life force, are now curling, loosening their grip on the branches, yellowing and falling to the ground, all perfectly aligned to mother earth’s natural rhythms. But, as is the selfless quality of a fig tree, while in season it gave bountifully of its fruits, without asking anything in return. My tree had been fruiting steadily for the last few months. I would study it daily, and before the birds and ants took their fill, I would pluck just a few of the best, most plump succulent fruits; the ones so ripe that thick red syrup would ooze from them in the heat of the day. I ate a few, but soon made an executive decision to freeze the fruits when perfectly ripe, rather than eat them, and make jam when my stash was large enough. 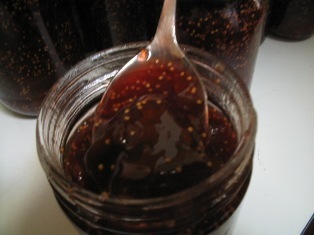 Yesterday I spent a joyful few hours making fig jam. I removed the figs from the freezer, laid them out to thaw, and cut them in half. I opened my trusty edition of Cooking with Kurma ( yes, I follow my own recipes), and measured all the ingredients carefully. Jam-making is an art not to be taken lightly. It is a favourite pastime of mine, and I already knew that this recipe worked well. I quadrupled the recipe. 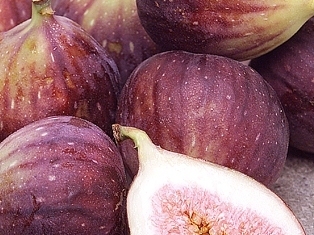 Soft, sweet and pulpy, figs occupy a high position amongst fruits. The ripe fresh fruit is juicy, wholesome and delicious. Figs are also a restorative food that help in quick recovery after prolonged illness. For best results, select figs for this delectable conserve that are all fully mature but not overripe and without rupture or blemish. 2 tablespoons water, if required. Wash the figs and cut off their tips. If the figs are small, cut them in half; if they are large, cut them in quarters. Spread the sugar on a tray and heat it in a pre-heated hot oven, taking care not to burn it. Place the figs in a 5-litre/quart saucepan along with the lemon zest and lemon juice over moderate heat. Bring them to the boil and cook them for about 10 minutes, or until they soften and the syrup darkens to a rich red colour. Do not stir them, and do not allow the figs to break up. You may need to add a little water. 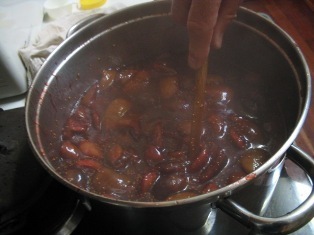 Remove the sugar from the oven, and gently stir it into the figs, being careful not to rupture them. When the sugar has dissolved, bring the mixture to a rapid boil and, without stirring, cook for another 10 minutes, or until the setting point is reached. Carefully ladle the conserve into sterilised jars. If you don’t like salty lassi, look away, look away now. Perhaps it’s an aquired taste for western palates, but it certainly has a big following in The Subcontinent. Food Bloggee Extraordinaire Sanjana has created another magnificent recipe page, and all credit goes to her for the above picture also. Visit there now and learn the classic art of the great savoury yogurt drink. You’ll have to hurry to grab a place at this exciting class. La Trobe University, Melbourne will soon be hosting its 4th annual hands-on cookery workshop with Kurma Dasa. Cooking and feasting! It’s as good as it sounds. me a lot. Do you have for me the recipe of mayonnaise? Or a mayonnaise that looks like the MacDonald mayonnaise? Here are three different recipes for eggless mayonnaise, lifted from my first cookbook ‘Great Vegetarian Dishes’. The first recipe uses condensed milk as the base and is a sweet mayonnaise. The second recipe calls for evaporated milk, and the third is a dairy-free variety featuring pureed tofu. Combine all the ingredients except the lemon juice in a bowl. Gradually add the lemon juice whilst stirring with a whisk until the dressing thickens. Allow the mayonnaise to set for a further 10 minutes in the refrigerator. YIELD: about 2 1/4 cups. Place the evaporated milk in a blender. While the blender is on, gradually add the oil until the mixture slightly thickens. Add the salt, optional honey, lemon juice, and mustard powder. Continue blending until the mixture thickens further. Allow the mayonnaise to set for a further 10 minutes in the refrigerator. YIELD: almost 2 1/2 cups. Combine all ingredients (except the lemon juice and water) in a blender. Blend until smooth and creamy. Gradually add the lemon juice. If the mayonnaise is too thick, add a little water. Refrigerate. For meat-lovers, the veggie burger was long seen as a sad stand-in that tried to copy the contours and textures of a classic beef patty while falling pathetically short of the pleasure. And for meat-refusers, the veggie burger served as a kind of penitential wafer: You ate this bland, freeze-dried nutrient disc because you had to eat it (your duty as someone who had forsaken the flesh) and because at many a restaurant or backyard barbecue, it was the only option available. I have a cookery workshop in Melbourne coming up in a little over 2 weeks. Brand-new fabulous menu! Don’t miss out. If you’ve attended any of Kurma’s classes, you’ll love this new selection. Bookings – call 03 85550361. Elizabeth Taylor, the violet-eyed beauty whose hectic off-screen love life often eclipsed her most sultry film roles, has died at 79. Her movies, public dramas and health problems made Taylor a frequent topic of cover stories in Life, People and other magazines. By the time she won her first Oscar at age 28, Taylor had been married five times. “What do you expect me to do? Sleep alone?” she said. I am sure that life will continue to happen for Elizabeth Taylor, albeit under different circumstances. The soul lives on. I am quietly preparing sourdough culture in the hope I will find some time to start baking regularly again. On the subject of breadmaking, I found this old blog interesting. Oil or ghee inside the chapati dough makes the breads softer and more tender. I prefer to leave out any oil or ghee, and spread the hot chapati with a little ghee after cooking. (*When salt is added to a dough, some of the negatively-charged chlorine ions will bond with the positively-charged sites on the gluten protein, neutralizing the overall charge. With the repulsive forces eliminated, the web will tighten, compact, and bond with itself more strongly. A more bonded, compact gluten web can better withstand the force exerted by the swelling air bubbles in an actively fermenting dough, and thus will expand more slowly). And for those who thought that adding/not adding salt in bread was an insignificant choice, think again. I hope he’s proven wrong. A grand Hare Krishna Rathayatra Parade was held in downtown Sydney on Saturday. But it was an extremely wet day, so I did not attend. Co-incidentally my sister Annie just sent me this photo that she took at a similar Hare Krishna festival 31 years ago in 1980. I am looking very confident, like a young Heston Blumenthal, and my dad is definitely still showing youthful vigour. My mother is wearing a beautiful garland of frangipani blooms straight from the neck of Lord Jagannatha, it seems. I had forgotten, but these things are all recorded nevertheless. This moment in time will never be repeated, just like the twigs and leaves that come together briefly in the rushing stream of time, and then separate forever.